Mobile ad hoc networks are attracting attention for their potential use in several fields such as collaborative computing and communications in indoor areas. Mobility and the absence of any fixed infrastructure make MANETs very attractive for mobility and rescue operations and time-critical applications. Considering mobility of the terminals, routing is a key process for operation of MANETs. In this paper, we analyze the performance of Optimized Link State Routing protocol in an indoor environment considering different scenarios for horizontal and vertical topologies. We evaluate the scenarios based on delay and jitter metrics. 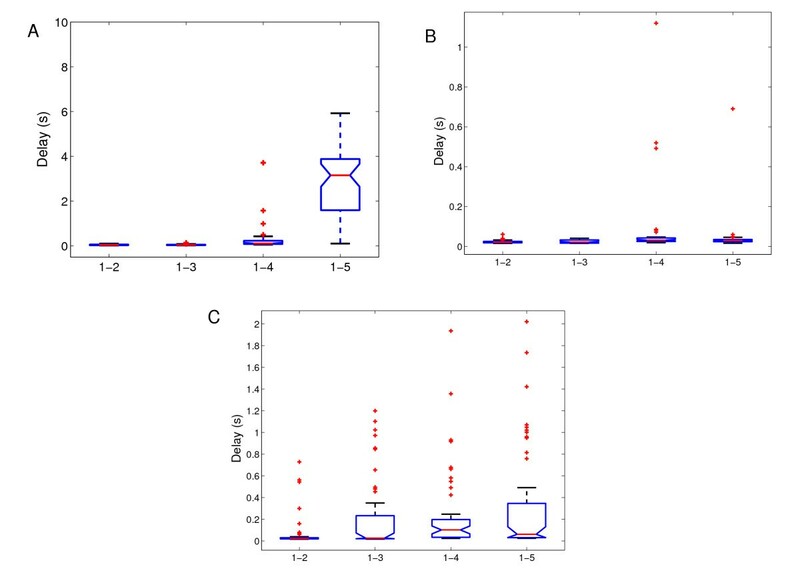 The experimental results show that for vertical topology the performance is affected more by mobility and number of hops, in comparison with the horizontal topology. A Mobile Ad hoc Network (MANET) is a group of wireless mobile terminals, which cooperate together by routing packets to each other on a temporary network. MANETs are attracting attention for their potential use in several fields such as collaborative computing and communications in indoor areas. Considering mobility of the terminals, routing is a key process for operation of MANETs. Most of the work for MANETs has been done in simulation, as in general, a simulator can give a quick and inexpensive understanding of protocols and algorithms. However, experiments in the real world are very important to verify the simulation results and to revise the models implemented in the simulator. A typical example of this approach has revealed many aspects of IEEE 802.11, like the gray-zones effect , which usually are not taken into account in standard simulators, as the well-known ns-2 simulator. So far, we can count a lot of simulation results on the performance of MANET, e.g. in terms of end-to-end throughput, delay and packetloss. However, in order to assess the simulation results, real-world experiments are needed and a lot of testbeds have been built to date . The baseline criteria usually used in real-world experiments is guaranteeing the repeatability of tests, i.e. if the system does not change along the experiments. How to define a change in the system is not a trivial problem in MANET, especially if the nodes are mobile. There is a lot of work done on routing protocols for MANET. In , the authors analyze the performance of an outdoor ad-hoc network, but their study is limited to reactive protocols such as Ad hoc On Demand Distance Vector (AODV) and Dynamic Source Routing (DSR). The authors of  perform outdoor experiments of non standard pro-active protocols. Other ad-hoc experiments are limited to identify MAC problems, by providing insights on the one-hop MAC dynamics as shown in . In , the authors present an experimental comparison of OLSR using the standard hysteresis routing metric and the Expected Transmission Count (ETX) metric in a 7 by 7 grid of closely spaced Wi-Fi nodes to obtain more realistic results. The throughput results are similar to our previous work and are effected by hop distance . The closest work to ours is that in . However, the authors did not care about the routing protocol. In , the disadvantage of using hysteresis routing metric is presented through simulation and indoor measurements. Our experiments are concerned with the interaction of transport protocols and routing protocol, for instance OLSR. In our previous work [10–14], we carried out many experiments with our MANET testbed. We proved that while some of the OLSR's problems can be solved, for instance the routing loop, this protocol still have the self-interference problem. There is an intricate inter-dependence between MAC layer and routing layer, which can lead the experimenter to misunderstand the results of the experiments. For example, the horizon is not caused only by IEEE 802.11 Distributed Coordination Function (DCF), but also by the routing protocol. We carried out the experiments with different routing protocols such as OLSR and BATMAN and found that throughput of TCP were improved by reducing Link Quality Window Size (LQWS), but there were packet loss because of experimental environment and traffic interference. For TCP data flow, we got better results when the LQWS value was 10. Moreover, we found that the node join and leave operations affect more the TCP throughput and RTT than UDP. 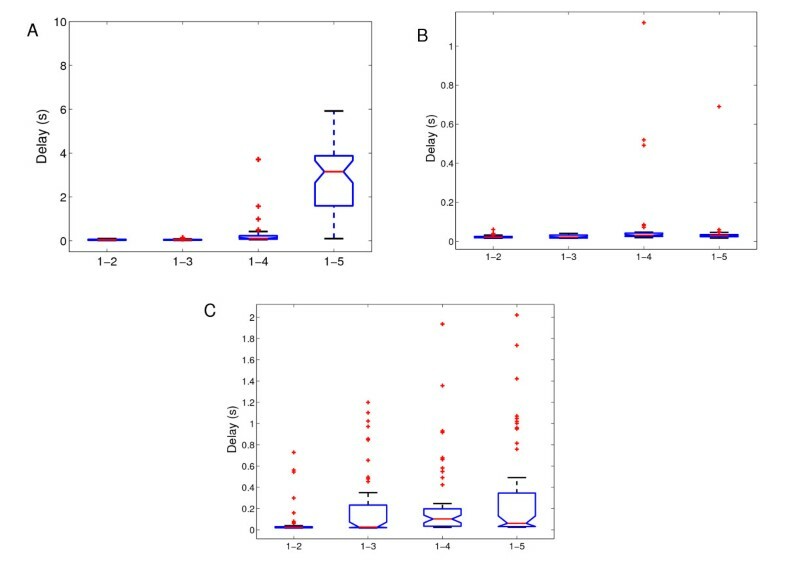 In this work, different from our previous work, we investigate the performance of a MANET testbed for horizontal and vertical topologies. We implemented seven MANET scenarios and evaluated the performance considering delay and jitter metrics. The structure of the paper is as follows. In Section 2, we show an overview of OLSR routing protocol. In Section 3, we design and introduce the implementation of our testbed. In Section 4, we give experimental results and make the comparison. Finally, conclusions are given in Section 5. The link state routing protocol that is most popular today in the open source world is OLSR from . OLSR with Link Quality (LQ) extension and fisheye-algorithm works quite well. The OLSR protocol is a pro-active routing protocol, which builds up a route for data transmission by maintaining a routing table inside every node of the network. The routing table is computed upon the knowledge of topology information, which is exchanged by means of Topology Control (TC) packets. The TC packets in turn are built after every node has filled its neighbors list. This list contains the identity of neighbor nodes. A node is considered a neighbor if and only if it can be reached via a bi-directional link. OLSR makes use of HELLO messages to find its one hop neighbors and its two hop neighbors through their responses. The sender can then select its Multi Point Relays (MPR) based on the one hop node which offer the best routes to the two hop nodes. By this way, the amount of control traffic can be reduced. Each node has also an MPR selector set which enumerates nodes that have selected it as an MPR node. OLSR uses TC messages along with MPR forwarding to disseminate neighbor information throughout the network. OLSR checks the symmetry of neighbor nodes by means of a 4-way handshake based on HELLO messages. This handshake is inherently used to compute the packetloss probability over a certain link. This can sound odd, because packetloss is generally computed at higher layer than routing one. However, an estimate of the packetloss is needed by OLSR in order to assign a weight or a state to every link. Host Network Address (HNA) messages are used by OLSR to disseminate network route advertisements in the same way that TC messages advertise host routes. In our OLSR code, a simple RFC-compliant heuristic is used  to compute the MPR nodes. Every node computes the path towards a destination by means of a simple shortest-path algorithm, with hop-count as target metric. In this way, a shortest path can result to be also not good, from the point of view of the packet error rate. Accordingly, recently olsrd has been equipped with the LQ extension, which is a shortest-path algorithm with the average of the packet error rate as metric. This metric is commonly called as the ETX, which is defined as ETX(i) = 1/(NI(i) × LQI(i)). Given a sampling window W, NI(i) is the packet arrival rate seen by a node on the i-th link during W. Similarly, LQI(i) is the estimation of the packet arrival rate seen by the neighbor node which uses the i-th link. When the link has a low packet error rate, the ETX metric is higher. The LQ extension greatly enhances the packet delivery ratio with respect to the hysteresis-based technique . Our testbed is composed of six laptops machines. The operating system (OS) mounted on these machines is Ubuntu Linux with kernel 2.6.28, suitably modified in order to support the wireless cards. The wireless network cards are from Linksys (model: WUSB54G ver.4). They are usb-based cards with and external antenna of 2dBi gain, transmitting power of 16+/-1dBm and receiving sensitivity of -80 dBm. We verified that the external antenna improves the quality of the first hop link, which is the link connecting the ad-hoc network. The driver can be downloaded from the web sites in references [18, 19]. In our testbed, we have two systematic background or interference traffic we could not eliminate: the control traffic and the other wireless Access Points (APs) interspersed within the campus. The control traffic is due to the ssh program, which is used to remotely start and control the measurement software on the source node. The other traffic is a kind of interference, which is typical in an academic scenario. For the horizontal topology, we constructed five experimental scenarios. Node states for each scenario are shown in Table 1. 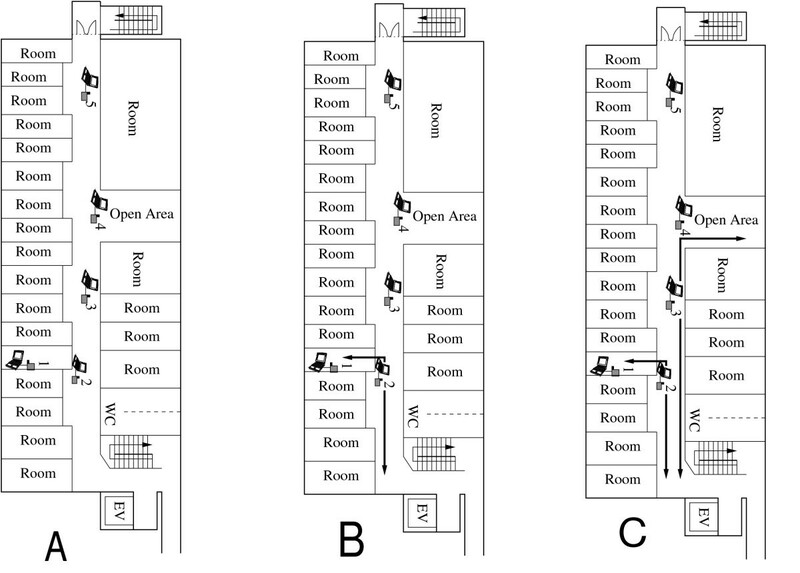 In the horizontal simple scenarios, nodes are placed in open areas of our fifth floor, while in the horizontal obstacle scenarios the nodes are placed inside rooms to analyze the effect of obstacles (walls). In Figure 1(a), all nodes are in a static state. We call this Horizontal Static (HST) scenario. In Figure 1(b), only relay node #2 is moving. We call this Horizontal Moving1 (HM1) scenario. In the third scenario, relay nodes #2 and #3 are moving (see Figure 1(c)). We call this Horizontal Moving2 (HM2) scenario. In Figure 2(a), nodes are placed inside rooms and they are static for all transmission time. We call this Horizontal Obstacle Static (HOS) scenario. In the last scenario (Figure 2(b)) only node #3 is moving. We will call this Horizontal Obstacle Moving (HOM) scenario. Types of nodes for each experimental model. Horizontal topology scenarios. A: HST, B: HM1, C: HM2. Horizontal obstacle topology scenarios. A: HOS, B: HOM. We constructed two experimental scenarios, for vertical topology. Node states for each scenario are shown in Table 1. In Figure 3(a), all nodes are in a static state. We call this Vertical Static (VST) scenario. In Figure 3(b), only node #6 is moving. We call this Vertical Moving (VMO) scenario. A snapshot for each node in vertical topology is shown in Figure 4. Vertical topolgy scenarios. A: VST, B: VMO. Snapshot of each node (Vertical Topology). In our previous work, all the parameters settings and editing were done using command lines of bash shell (terminal), which resulted in many misprints and the experiments were repeated many times. In order to make the experiments easier, we implemented a testbed interface. For the Graphical User Interface (GUI) we used wxWidgets tool and each operation is implemented by Perl language. wxWidgets is a cross-platform GUI and tools library for GTK, MS Windows and Mac OS. We implemented many parameters in the interface such as transmission duration, number of trials, source address, destination address, packet rate, packet size, LQWS, and topology setting function. We can save the data for these parameters in a text file and can manage in a better way the experimental conditions. Moreover, we implemented collection function of experimental data in order to make easier the experimenter's work. The experimental parameters are shown in Table 2. We study the impact of best-effort traffic for Mesh Topology (MT). In the MT scheme, the MAC filtering routines are not enabled. We collected data for two metrics: delay and jitter. These data are collected using the Distributed Internet Traffic Generator (D-ITG) , which is an open-source internet traffic generator. The transmission rate of the data flows is 122 pps = 499.712 Kbps, i.e. the packet size of the payload is 512 bytes. All experiments have been performed in indoor environment, in the fifth floor and at the stairs of our department building. All laptops are in radio range of each other. The experimental time for one experiment was about 300 seconds. In moving scenarios, nodes stopped at corners for about three seconds before moving again. We measured the delay and jitter, which are computed at the receiver. For OLSR, wTHELLO < TExp, where TExp is the total duration of the experiment, i.e., in our case, TExp = 300 seconds, and THELLO is the rate of the HELLO messages. However, the testbed was turned on even in the absence of measurement traffic. Therefore, the effective TExp was much greater. As MAC protocol, we used IEEE 802.11b. The transmission power was set in order to guarantee a coverage radius big enough to cover all one-hop physical neighbors of each node in the network. Since we were interested mainly in the performance of the routing protocol, we kept unchanged all MAC parameters, such as the carrier sense, the retransmission counter, the contention window and the RTS/CTS threshold. Moreover, the channel central frequency was set to 2.412 GHz (channel 1). In regard to the interference, it is worth noting that, during our tests, almost all the IEEE 802.11 spectrum had been used by other APs disseminated within the campus. In general, the interference from other APs is a non-controllable parameter. Here, we show the measured data by the box and whisker plot of the metrics according to the model types. Box and whisker plot is a convenient way to show groups of numerical data by lower quartile, median, upper quartile, and the outliers. 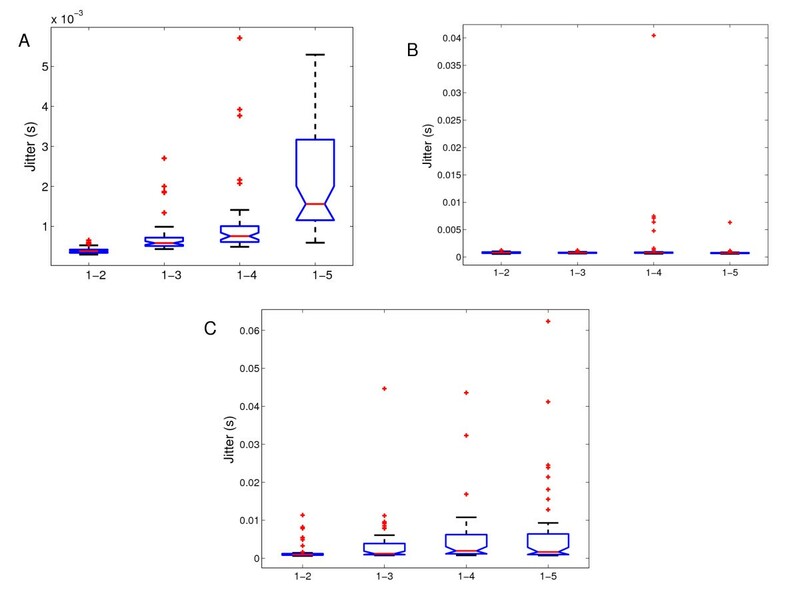 In the plot, the bottom and top of the box are always 25th and 75th percentile, respectively, and the band near the middle of the box is always the median. The end of the whiskers can represent the lowest datum which is still within 1.5 inter-quartile range of the lower quartile, and the highest datum which is still within 1.5 inter-quartile range of the upper quartile. The observed metrics are shown in terms of the median value for four different flows (source node → destination node). For horizontal topology, we notice that there is a better performance in both delay and jitter metrics, for HM1 scenario. In Figure 5 are shown the delay results for horizontal topology. When all nodes are static (see Figure 5(a)), we notice that the delay have some oscillations in the case of #1 → #4 flow and increases noticeably in the case of #1 → #5 flow. In Figure 5(b) is shown the delay results for HM1 scenario. For #1 → #4 flow and #1 → #5 flows there are some oscillations, but the median values show good performance. For HM2 scenario, we show results in Figure 5(c). Oscillations happen in all the flows (#1 → destination node). The median values are increasing with the increase of the number of hops. Delay results for horizontal topology. A: HST, B: HM1, C: HM2. Delay in HOS and HOM scenarios, is shown in Figure 6(a) and Figure 6(b), respectively. The nodes are Non Line Of Sight (NLOS) condition, so the communication is more difficult in these two scenarios, especially for the #1 → #5 flow, where there is a noticeable decrease in performance. In HOM scenario, there are more oscillations, introduced by mobility of node #3. Delay results for horizontal obstacle topology. A: HOS, B: HOM. We show jitter results for the horizontal topology in Figure 7. For HST scenario (see Figure 7(a)), we observe that jitter values increase progressively as the number of hops increases. It looks like the routes become unstable. This happens because different links may have similar ETX values and the route to destination changes a lot. In Figure 7(b) for HM1 scenario, this effect is minimized by the movement of the intermediate node #2. In fact, this sounds contradictory with the dynamism introduced by mobility in our previous works . But in this case, choosing the link with the highest ETX becomes easy and the communication seems to establish stable routes. However, the dynamism introduced by mobility is still present, as in HM2 scenario there is an increase and oscillations in jitter values. Jitter results for horizontal topology. A: HST, B: HM1, C: HM2. Regarding jitter metric, in HOS scenario the performance is good when destination is node #2, #3 or #4. 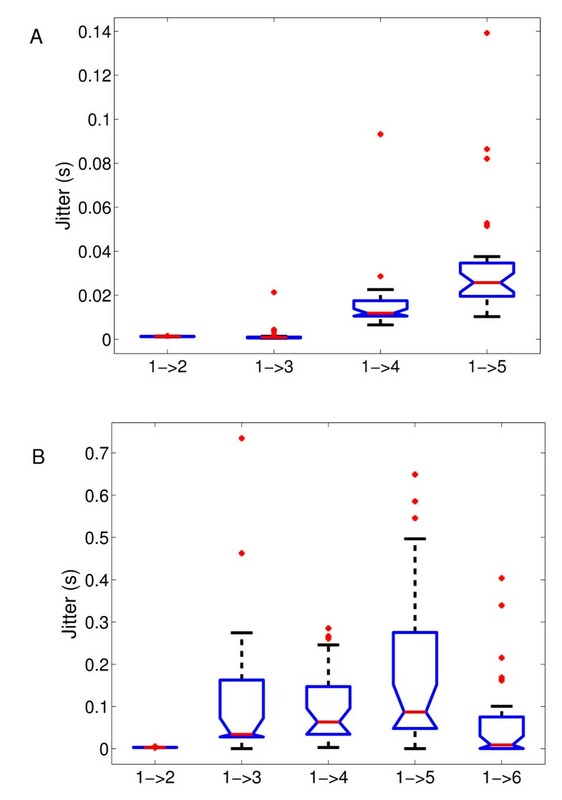 As shown in Figure 8(a), the communication of node #1 with node #5 shows higher jitter, which is induced by the presence of walls. For HOM scenario, results are shown in Figure 8(b). We notice similar results with HOS scenario, but there are more oscillations. Mobility and obstacles decrease the performance. Jitter results for horizontal obstacletopology. A: HOS, B: HOM. In vertical topology we have implemented two scenarios. We show the results for delay and jitter, in Figure 9 and 10, respectively. In Figure 9(a), the delay results for VST scenario show that OLSR has a good performance when communication occurs in one or two hops. When the destination node is node #4, which is located at the second floor, we notice oscillations and the values of delay increase as the communication in three or more hops becomes difficult. The performance becomes worse when the destination is node #5. The same tendency is also observed regarding jitter metric, as shown in Figure 10(a). Delay results for vertical topology. A: VST, B: VMO. Jitter results for vertical topology. A: VST, B: VMO. 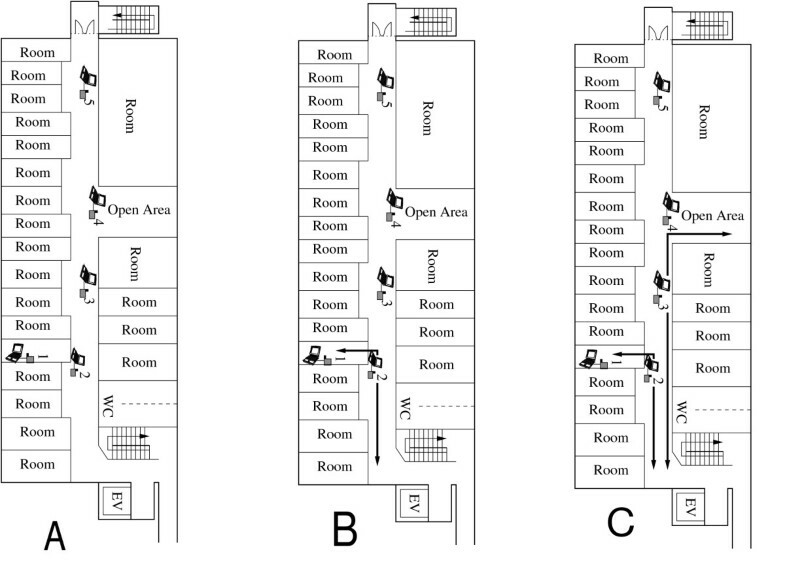 In VMO scenario, node #6 moves from the fifth floor to the first floor. The mobility of this node brings dynamism regarding routes on the network. This is prooved by an increase in the values of delay and jitter, in comparison with VST scenario, as shown in Figures 9(b) and 10(b), respectively. 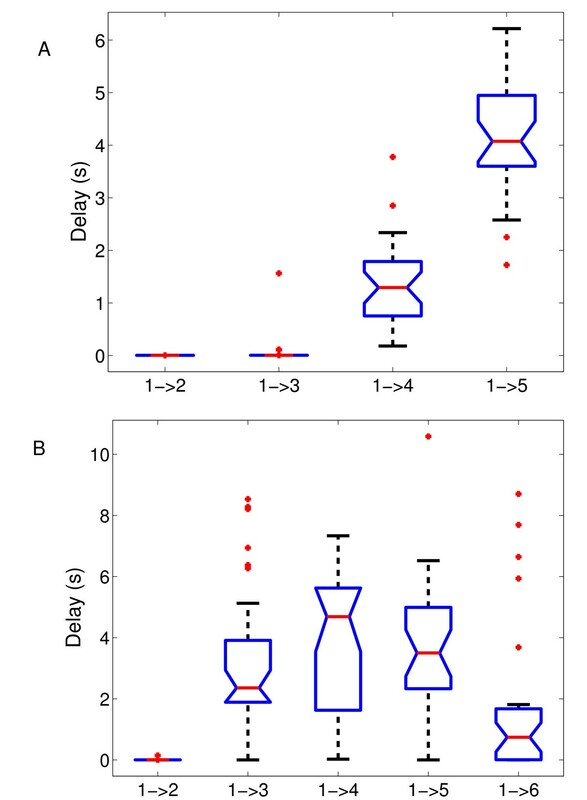 However, if we observe the boxplot of the #1 → #5 flow in Figure 9(b), we notice that delay values are smaller than in the #1 → #4 flow. Comparing with the values of VST scenario, where delay increased progressively with the increase of hop distance, in this case the movement of node #6 also helps the communication to node #5 by creating more routes available and more probability to choose a better route from node #1 to node #5. Regarding #1 → #6 flow, the destination node #6 is moving during all the time of transmission. We notice oscillations in this case, caused by mobility. However, the perfomance for this flow, regarding delay and jitter is better than when destination is node #3, #4 or #5. If we compare static scenarios for both topologies, we can say in general that the median values for delay and jitter are higher in VST scenario than in HST scenario. Also from Figures 5, 7, 9 and 10 we can see that when nodes are moving, in horizontal topology the values of delay and jitter are lower. In the vertical topology the nodes create links between each-other in the NLOS condition. Based on this fact and the results of our experiments, we can conclude that the link quality is better in horizontal topology and mobility influences delay and jitter more in the vertical topology. 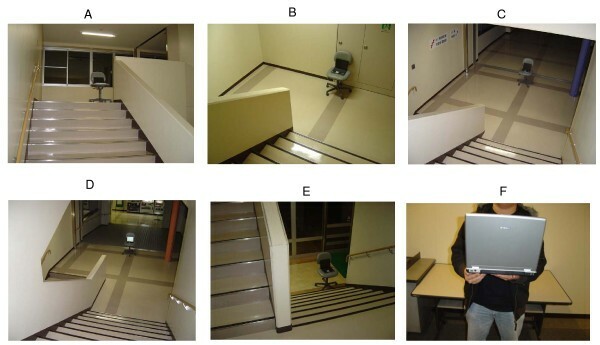 In this paper, we conducted experiments by our MANET testbed for horizontal and vertical scenarios. We used OLSR protocol for experimental evaluation. In our experiments, we considered seven models: HST, HM1, HM2, HOS, HOM, VST and VMO. We assessed the performance of our testbed in terms of delay and jitter. From our experiments, we found the following results. 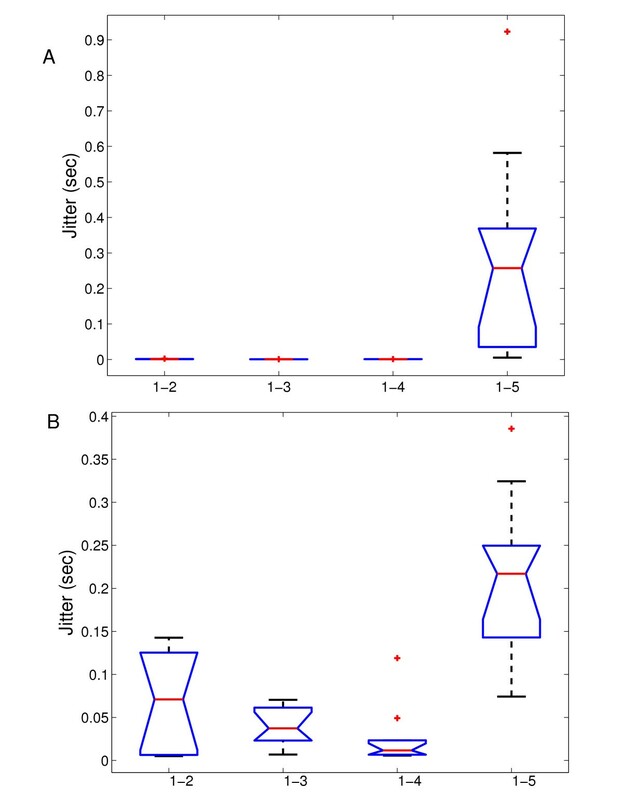 In horizontal topology, when in HST scenario the number of hops increases to 3 or more hops, there are oscillations. Delay and jitter values increase progressively as the number of hops increases. There is a better performance in both delay and jitter metrics, for HM1 scenario. The movement of a relay node helps the communication between other nodes to establish more stable routes. In HM2 scenario oscillations happen in all flows and the median values are increasing with the increase of the number of hops. For HOS and HOM scenarios, the communication becomes difficult, because the obstruction of obstacles. Delay and jitter values are increased when the destination is node #5. In vertical topology, for VST scenario OLSR has a good performance when communication occurs in one or two hops. When the communication needs three or more hops, we notice oscillations and the values of delay increase. The same tendency is also observed regarding jitter metric. In VMO scenario the mobility of node #6 brings dynamism regarding routes on the network. In this case the movement of node #6 also helps the communication to node #5 by creating more routes available and more probability to choose a better route from node #1 to node #5. In the vertical topology the nodes create links between each-other in the NLOS condition. Though, the link quality is better in horizontal topology and mobility influences delay and jitter more in the vertical topology. 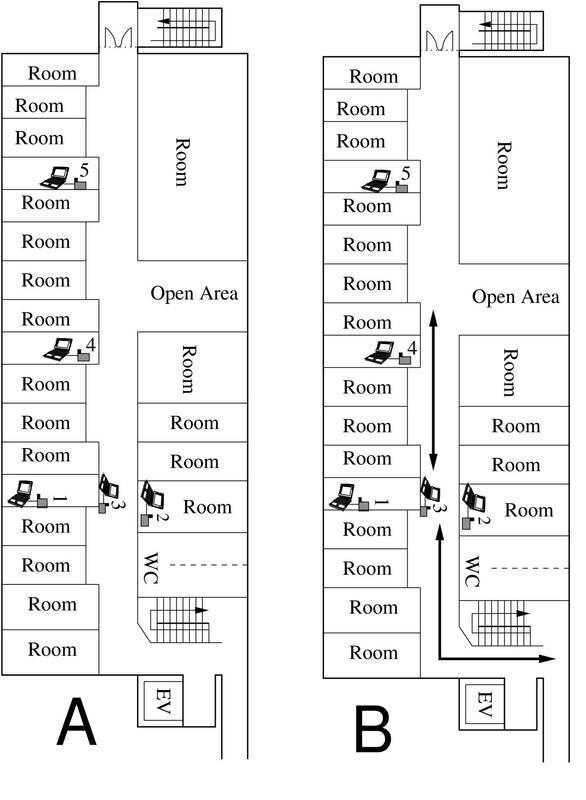 In this work, we carried out the experiments with a proactive routing protocol in an indoor scenario. In the future, we would like to consider the performance of reactive protocols and compare the experimental results with simulation results. Moreover, we would like to evaluate the performance of our testbed for outdoor scenarios. This work is supported by a Grant-in-Aid for scientific research of Japan Society for the Promotion of Science (JSPS). The authors would like to thank JSPS for the financial support. MH designed and implemented the testbed, including scenarios and data gathering. EK participated in the data analysis and theoritical contents of the paper. TO implemented the graphical user interface for better control of experiments. MI did the initial settings of the testbed and implemented HST scenario. LB participated in the testbed design and implementation and checked the final version of the paper for submission.